Preheat the oven to 400 degrees. Wash the Brussels sprouts and trim off the bottom and loose outer leaves. For medium to large-sized sprouts, cut them in half. If they are really tiny, you may want to leave them whole instead. Toss the sprouts in oil, salt, and pepper. Spread them over a baking sheet putting the cut side down. Slide the pan in the oven and roast for 15 minutes. Toss the Brussels sprouts and cook for 5 more minutes or until the outside begins to brown and the inside is cooked, but still firm. Meanwhile, make the dip. Mix together all of the remaining ingredients. Taste and adjust the salt, pepper, and lemon juice to taste. 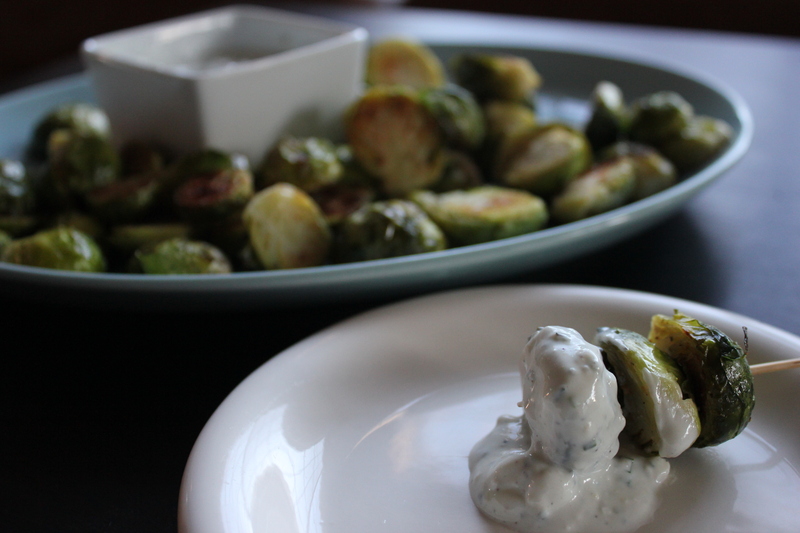 Serve the Brussels sprouts warm or at room temperature. If serving as an appetizer, toothpicks are helpful. What gorgeous colors! I’d probably eat them like candy too, although my guy tends to turn his nose up at vegetables… Oh well, more for me! My son used to cover them in goat cheese and chomp them down, this season he is not interested but my daughter loves them. My approach is to keep serving them until they both profess their love. Wish me luck! It’s hard to get kids to like things at the same time! My mom had similar troubles with us and blueberries. Both my brother and I ate them when we were babies, but we went through a phase during elementary school where we refused to eat them. Now we both love them again — go figure! I am loving the Brussels sprouts enthusiasm, thanks Eileen! 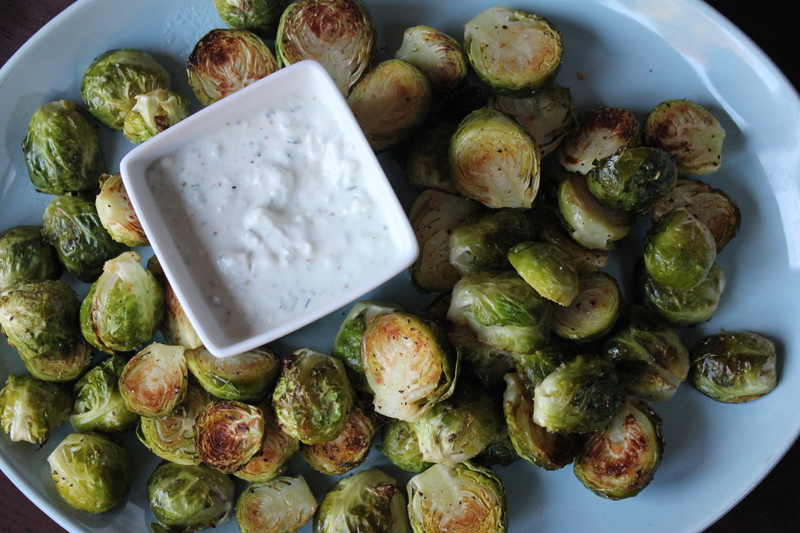 How funny – I’m sitting here catching up on blogs while I munch on some brussels sprouts I roasted a week ago. I haven’t gotten around to photographing them, but I’m posting them sometime this month. I completely agree – they’re a great little healthy snack! And I love your dip!! It’s perfect. That is great. I recently discovered how good they are left over. To my surprise, even my students want a taste when I bring them to school. So good. I will look forward to your post! These are indeed like candy! I love the idea of serving them as an appetizer, too. And your dip just sounds sublime. Happy new year! Thanks Hannah. Happy Nee Year to you as well!